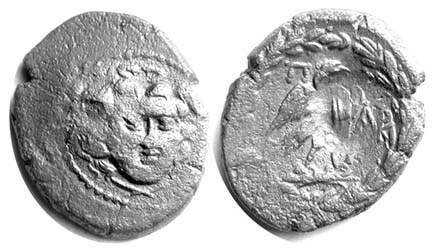 The hemidrachm from Parion has an unusual design: a staring female face with tongue protuding, surrounded by snakes. The reverse shows a bull standing left and looking back. The greek letters ΠΑ appears above the bull and ΡΙ is between the legs of the bull. We know these coins come from Parion because of the legend: ΠΑΡΙ, the Greek letters for PARI. The face is the "gorgoneion," a mask in imitation of the head of the gorgon. In archaic and classical Greek art gorgons were always shown facing the viewer, protruding tongue, and teeth. Very early ones were sometimes depicted with beards, but never on coins. In Greek mythology there were three gorgon sisters. The most famous was Medusa who was decapited by the hero Perseus. The hair of gorgons was never depicted as living snakes in ancient times. The snakes, if any, were shown near or later sometimes in the hair. Sometimes the gorgon head had wings, but never on the coins of Parion. It isn't clear why Parion chose a hideous monster as an emblem for the city. Perhaps it was chosen as a symbol of terror. It was used on Greek shields to frighten the enemy as well as for it's hypnotic ability--something about the gorgoneion attracts gaze of enemy soldiers toward the shield and thus away from the weapon hand. Could the gorgon head on Parion's coins represent military shields and ability of Parion's military? 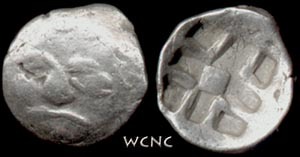 Parion may have simply copied the design from another city's coins (it has been suggested that Neapolis in Macedon may have copied its gorgon staters from Athens). 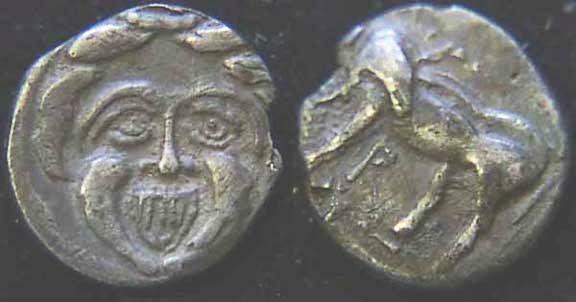 The gorgon/bull coins are believed to date from the classical period in Greek history, probably 350-300 BC. The other coin of Parion one commonly sees is the older "archaic" drachm which come from the end of the archaic period, around 480 BC. 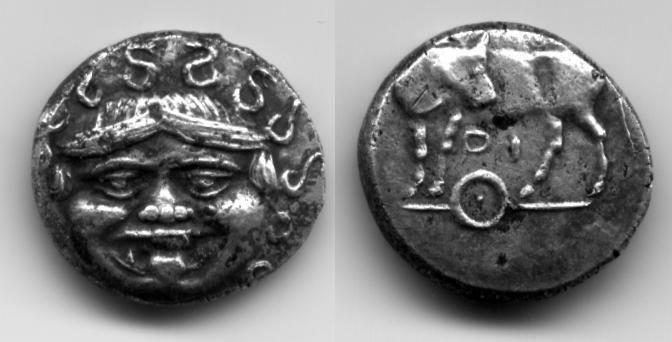 The archaic drachms come in several forms. 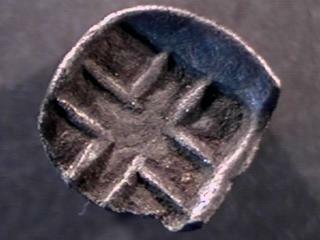 The common kind have a reverse with a pellet at the center of a cross within an incuse square. This reverse is described as "cruciform incuse square." Parion later struck a tetradrachm with the gorgon type and at least three types of bronzes. The tetradrachm is rare -- the only image I've seen is in the Hunterian catalog. The bronzes are scarce to rare. A bronze will be pictured below. Other devices on Parion coins include an altar, torch, thunder, grapes, Athena, Zeus, Artemis, Demeter, Nike, and Hermes. Some examples of the archaic issue. I've never seen another example of this reverse type, a quadripartite incuse square with each square bisected. At 3.83g this is the heaviest example in my collection. It has the globular eyes, simple nose and pit-like mouth I've only seen with the irregular square type. Unpublished? Readers who have seen this reverse type, in catalogs or private collections, please contact me. Oddly, a similar incuse square is present on an electrum Phokaian coin published as BMC Ionia Phocaea 3. The obverse of the Phokaian coin is a facing head described as Silenos. This is the "irregular incuse square" reverse. (This example is a little more regular than is typical for the irregular reverse.) The examples I've seen have globular eyes and tend to be heavy, this example is 3.52g. This and the next are the most common type. The face is somewhat clown-like. The eyes are almond-shaped and the nose looks like a nose. The reverse always has a pellet in the center although they can be quite weak. I'm not clear why it was so weak, perhaps the dies were heavily worn? The first example is 3.1g and the second 3.0g. Nice examples of this type command a heavy premium in the market, but typical ones can be very inexpensive. This example is much lighter than the others at only 2.1g. The nose is also highly unusual. There is a sort of "cartoon 2D nose" effect. I suspect this is an ancient imitation. This picture makes the coin look nicer than it is. The actual coin is quite worn. This coin is in very high relief and the reverse is double struck. (Or perhaps overstruck?) The style is quite different from other examples I've seen of the archaic type. It looks like a high-relief version of the gorgon/bull design. 3.2g. The reverse of this coin is double-struck, or perhaps overstruck on another example. This is a fourreé, an ancient counterfeit. It is made of bronze and silver-plated. 2.28g. 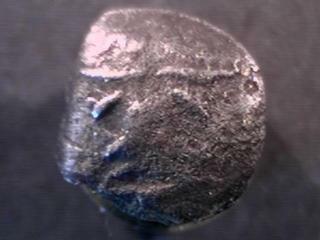 This was sold as a "Celtic imitation" of Parion This coin and the next two have a thin, cupped flans. Dewing 2349 is an example of this coin. The Dewing catalogers for this region, Ursula Pause-Dreyer and Silvia Hurter, attribute it to an uncertain mint in Western Asia Minor. Dewing's example has a pellet in the center and masses 1.76g. An example without the pellet is SNG Deutschland Leipzig 1085, attributed to Parion and massing 1.73g. The first example has a rather vicious flan crack and weighs 2.2g. The second example has a well defined square rather than a pellet at the center. 1.6g. This example masses only 0.89g. I believe it to be a half-unit of the above two and perhaps unpublished. Seen anything like this? I'd like to compare this with other examples, if any. I believe this to be an unpublished lead token of the above. Please, if you have anything similar, contact the author. MODERN CAST COUNTERFEIT. See Cast Greek AR for more details. When attributing with Sear GCV numbers, I use 3917 for examples above 3.5g, and 3918 for the rest. If attributing with SNG Copenhagen, the irregular incuse reverse is 256. (If you have SNG Cop, look up the issue. The Copenhagen example looks like an evil bird! Dewing 2200 is a nice example of the cruciform incuse with pellet. 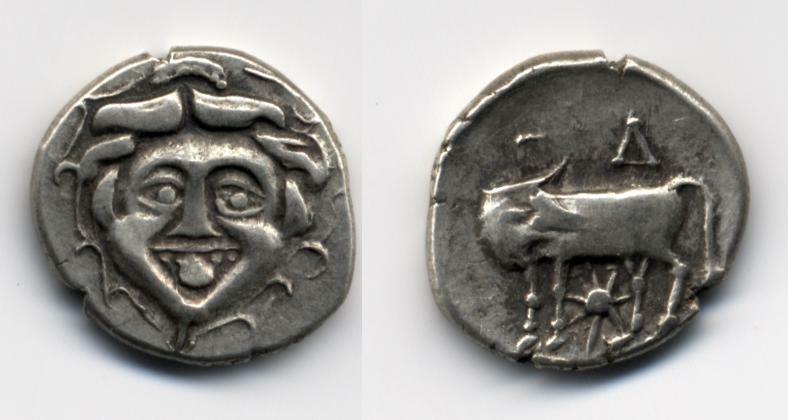 The classical gorgon/bull hemidrachm is popular coin. The gorgoneion is always circled by snakes. Some examples depict the gorgon wearing a stephane (hat), an artistic choice which doesn't seem to be found elsewhere in Greek art. Usually teeth are shown, but not always. The reverse always depicts a bull looking backwards. There is almost always a symbol, which is usually placed below the bull. The earth may be represented as a line below. The first three examples are typical. Weights 2.38g, 2.2g, and 2.3g. Symbols are wreath, bucranium (? ), and an unknown symbol respectively. The first example has the gorgon wearing a dotted hat, the other two have no such headgear. 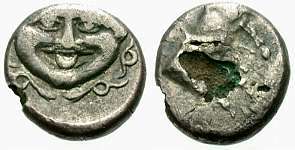 The first example appears to have a symbol on the front above the head, a monogram resembling the letter E.
The first example is a die match for Wheaton College Collection of Greek and Roman Coins 232. The next four are unusual. The first two are foureés, plated ancient counterfeits. (2.0g and 1.3g.) The third example, with its odd style, is perhaps an ancient imitation. The final example is not only crude, but a foureé as well! Another example of an imitation of the Parion gorgon / bull hemidrachm can be seen in Numismatik Lanz München auction 109 lot 58. 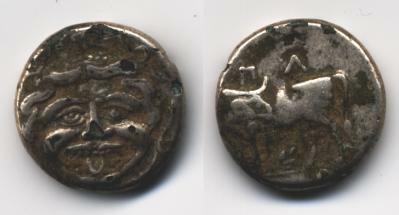 Another foureé can be seen on the Ancient Greek and Roman Coins FAQ Greek fourré page. Readers are invited to send notices of other foureés and imitations, I'd like to look for die matches. Sear suggests a value of £85 for this issue. These examples cost $50-90. anchor unpublished. photo by request. Weber 5141 (Same obv die as Hunterian 2, monogram off flan), wreath reverse. Alex G. Malloy auction LXV lot 113. (Same dies (?) as Dewing. Previously offered as Alex G. Malloy auction LXI lot 125). Ancient Auction House eBay item 1350023970 (closed May 10 '02, same dies as Dewing). That's five obverse dies. All examples except Hunterian have wreath reverse, and Weber 5141 pairs the Hunterian die with a wreath. I theorize that as more monogrammed coins are found the wreath will be the most common reverse. On all examples exception the Ancient Auction House March 20 the gorgon has teeth. 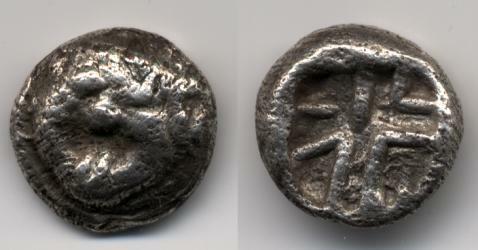 The first example is similar in style and type to the hemidrachms. It is much larger (22mm diameter). Examples have been published in SNG France (1402) and SNV von Aulock (1327). The second example is oval shaped, 18x22mm, weighing 6.97g. The gorgon appears more humanistic and the tongue does not protrude. The reverse (eagle) is obscured by an unrecognized countermark. Parion also struck an AE13 with owl reverse, and perhaps a smaller bronze with bull reverse, although on that coin the facing head is described as 'Athena'. The eagle type is scarce and the others rare. This coin has the proper weight and type of a Parion hemidrachm but the style is wrong. The gorgon is in the style of later Apollonia Pontika drachms, for example Dewing 1275. The surrounding snakes radiate outward from the gorgoneion rather than circling it in Parion fashion. This coin first surfaced in 2001 and was offered on eBay in May 2002 first as a legitimate Apollonia drachm then withdrawn and changed to possible forgery. Readers knowing of die links to this coin as asked to contact the author. 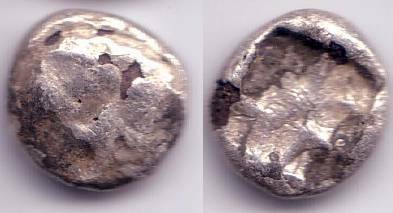 Cast fakes of archaic Parion silver units have been identified. Also see the Historia Numorum entry for Parium. Greek coins and their values. Vol. II. Asia and North Africa by David Sear. 1979. The Arthur S. Dewing collection of Greek coins, edited by Leo Mildenberg and Silvia Hurter. 1985. Catalogue of Greek Coins in the Hunterian Collection, University of Glasgow, George McDonald. 1899-1905. Wheaton College Collection of Greek and Roman Coins; J. David Bishop, R. Ross Holloway. 1981. Sylloge Nummorum Graecorum, Deutschland, Sammlung der Universitätsbibliothek Leipzig. 1993. Keltische Numismatik 2 Robert Forrer.